If you're looking for a game that challenges not only your mind, but your physical senses as well, try a dexterity game, where precise motor control (and sometimes even fast reflexes) are as important as strategy, and in fact become the strategy. Dexterity games can include party games (they get tougher after a few drinks! 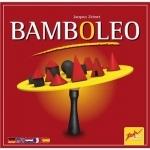 ), kids games, and even abstract games. 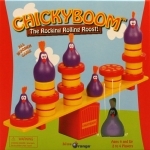 They are especially popular for kids, because building things – and then watching them topple over – is just plain fun! Angry Birds – Build, launch, and destroy! Operation – Surgery requires a steady hand! The age-old battle between Angry Birds and egg-stealing pigs continues! The birds will have their revenge! Build, launch and destroy with an exciting skill-and-action game based on the best-selling phone app. The game features three Angry Birds, green pigs, one slingshot-style launcher, structure pieces and mission cards. Players draw a card and build the structure shown before their opponents launch an Angry Bird in an attempt to knock it -- and the pigs -- down to win points. A cork ball on the top of a wooden pedestal carries a board outbalanced by about 25 wooden pieces. These pieces have different forms, sizes and weights (!). In turn, every player takes away one of these pieces from the board, still trying to keep the balance. 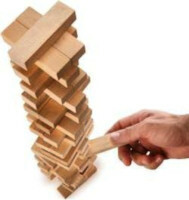 Some slope positions of the board seem next to impossible -- when it tumbles, the game is over. The player who was able to put aside the most pieces, wins. A wobbly challenge for the whole family and a pleasure with a slope to play, enjoy and watch. See how your skills stack up! All the fun of the popular Chairs stacking game is available in a collectible tin. Stylish tin contains 24 chairs in 8 different styles, and instructions. Get creative and start stacking with a style all your own. There are endless ways to construct a Chairs masterpiece. The Chairs Game Collectible Tin is fun for the whole family! All you need is a steady hand and creative thinking. Players take turns adding a chair to the stack one by one. The tension mounts as the tower grows! Don't topple the Chairs or you're out of the game. With Fastrack, the action is non-stop and the fun is plentiful.Using the elastic cord, be quick and aim well to be the first to send all of the disks zooming across to the other side. 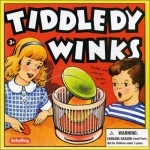 This high-quality wooden game is for 2 players, ages 5 and up. 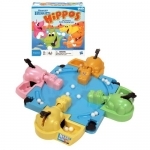 It's a fast-paced game that holds the interest of both kids and adults. WARNING: You may find it difficult to stop playing! Based on the top-selling Apple iOS and Android app, the Fruit Ninja Slide of Life action game turns the fun of the digital app into fast and frenetic physical play. Both kids and adults alike love the app's addictive action of chopping and slicing flying fruit while avoiding the bombs, and now they can do it for real on either the table top or the floor. With two toy ninja swords, 20 physical fruit and bomb pieces, and 40 Fruit Ninja mission cards, this exciting skill and action game allows players to race to physically slash and splatter fruit pieces like true ninja warriors. 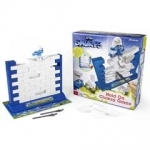 Make 'n' Break is an exciting challenge for builders of all ages. You'll need a good eye and dexterous fingers as you race to create as many wacky structures as you can in the time allowed. But watch out - some of the structures are very difficult to build, and time is running out!! Game includes one timer, 10 building blocks, 80 building cards, 60 counters and one die. 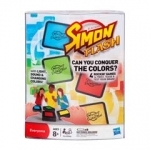 Simon Flash is a high-tech twist on the legendary Simon memory game! With four games in one, it tests players' memory and logic skills to the max. Families and kids alike will want to spend hours testing their memory in fun competition on this electronic version of the classic Simon game. The electronic Wonder-Link technology lets the cubes know where they're shuffled, when the game is won and the final score, so this is a Simon game that takes out the hassle and gives you more time to play. Can you conquer the colors in all four games?